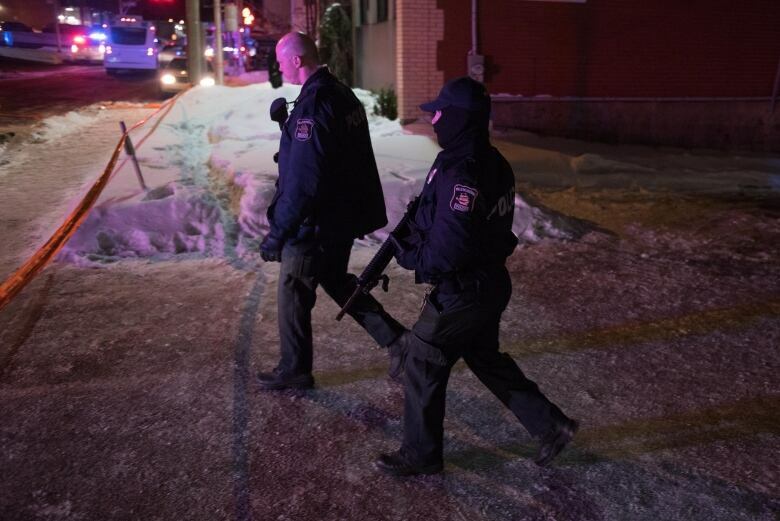 Drawing on interviews and court documents, CBC attempts to recreate what happened Jan. 29, 2017, the night of the Quebec City mosque shooting. 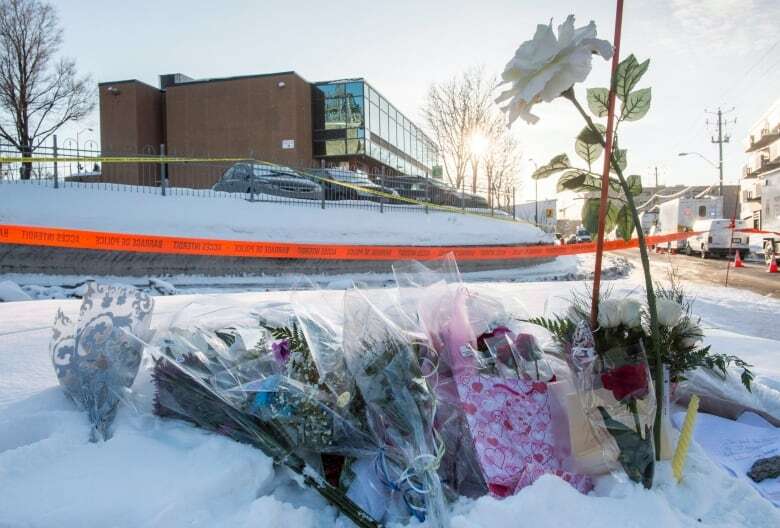 CBC sought to recreate moments of last year's shooting at the mosque in Sainte-Foy, Que., and its immediate aftermath. The following is based on in-depth interviews and court documents. UPDATE: On March 28, 2018, Alexandre Bissonnette pleaded guilty to all 12 charges against him. It is 7:30 p.m. when Aymen Derbali decides to attend isha prayers at the mosque near his home in the Quebec City suburb of Sainte-Foy. Prayers had already begun by the time he left home, but he lives close enough to catch the end. The lot is full so he parks his car a few blocks over and hustles inside, not noticing the two figures slumped on the pavement by the door, bleeding in the darkness and the freshly fallen snow. He takes his boots off and, in the hallway, walks past a man who is staring into the crowded prayer room. When he enters, Derbali notices that for some reason everyone is huddled by the far end, near the mihrab. Two crisp reports ring out, followed by screams. His mind begins processing the situation: It is 7:55 p.m. and he has just walked into a mass shooting. He could have run. He could have ducked into the bathroom directly behind him. But instead Derbali decides to attract the gunman's fire. He reasons the gunman would exhaust his ammunition on him and spare his friends, or the police would arrive. Whichever came first. Derbali crouches, ready to pounce. A bullet slams into his chin. He locks eyes with the man he passed in the hallway. They are several metres apart but the man walks toward him, firing again and again. Derbali collapses in a pool of blood as the gunman reloads. He opens his eyes a few moments later. Someone is cradling his head. His body is riddled with seven bullets. He is hit in the arm, the foot, the stomach. One bullet cut an artery near his heart, another bullet (or perhaps the same one) sliced through his spinal cord near the C8 spinal nerve. His eyes keep closing; the faces around him still urging him to keep them open. Derbali forces his eyelids open again, long enough to see the dark navy blue of a Quebec City police uniform. He can hear the officers calling on everyone to freeze, to raise their hands. His eyes close. In the darkness, he sees an image of his one-year-old daughter. This is death, he thinks to himself. Two months later, he will open his eyes again. The night shift starts quietly for Sgt. Jonathan Filteau of the Quebec City police. "There must be a Canadiens game on, or maybe an episode of The Voice," he jokes to a colleague. 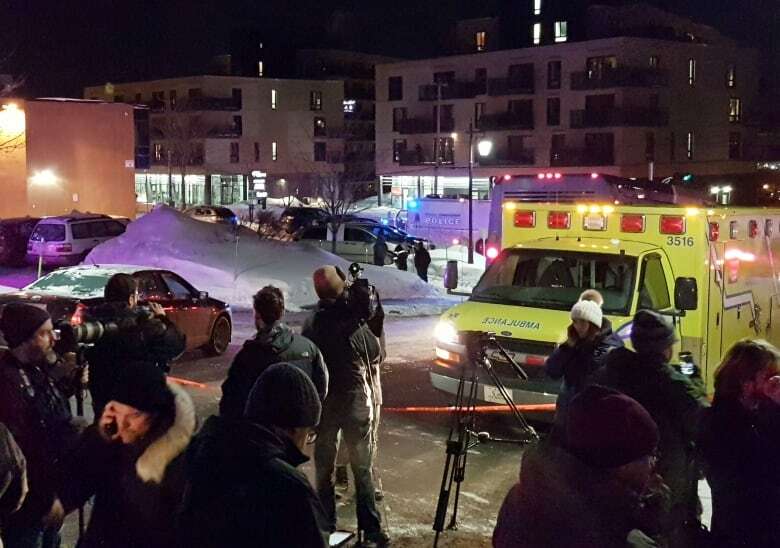 Less than an hour later, as he is patrolling the streets of Sainte-Foy around 7:54 p.m., a priority one call is broadcast over the radio: man shot near 2877 Sainte-Foy St. Four minutes later, he rendezvous with two other officers on the street, just west of a former credit union that had been converted into a mosque. They charge toward the front door, where they spot a man with what seems to be an assault rifle at his feet and two bodies close by. 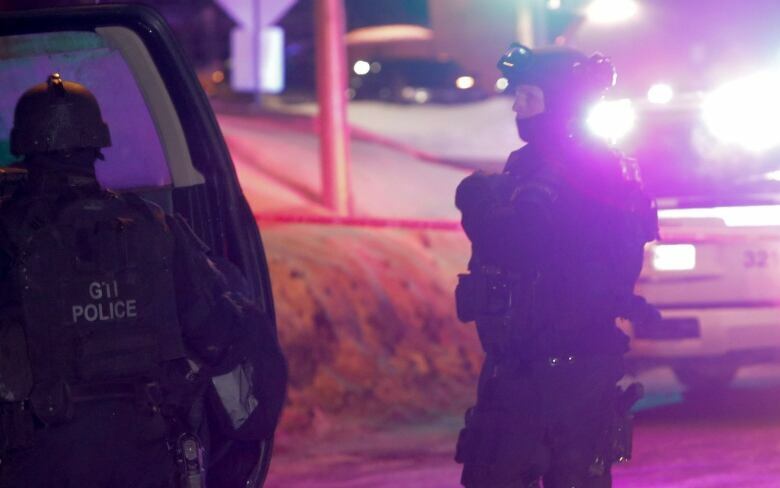 That man, Mohamed Belkhadir, was shovelling snow when the shooting began and hid nearby. When he emerged he saw bodies, outside and inside the mosque, and placed his jacket over one of them. He looks up to see a handgun pointing in his direction. Thinking the gunman has returned, Belkhadir legs it eastbound. Thinking Belkhadir might be a suspect, Filteau and the other officers give chase. Filteau warns Belkhadir that he'll shoot if he doesn't stop. The 29-year-old engineering student obeys. He's handcuffed and will spend the night in jail before he's cleared of suspicion. Filteau returns to the front door of the mosque. He is the kind of cop who eschews the mundane. "A man can stand almost anything except a succession of ordinary days," is one of his favourite quotes, often attributed to the German Romantic writer Goethe. Filteau has taken leave from the Quebec City police force a half-dozen times in his career to work on UN missions in Iraq, Haiti, and Ivory Coast, among other global hot spots. He is a close-protection specialist; he trains other officers on how to respond to mass shootings. Sundry medals hang from his dress uniform. Reinforcements arrive. Filteau can hear screaming coming from inside the mosque. He leads a group of officers across the threshold. They see two more lifeless bodies. The prayer room is thick with white smoke and the acrid smell of gunpowder. Spent shell casings and empty magazines of a 9 mm handgun litter the floor. Filteau guesses there are between 30 and 40 terrified men in the room. Some are bleeding profusely. Others are not moving at all. The police officers still have no idea how many suspects they are looking for, or where they might be. "Hands in the air. Nobody move," they shout. Filteau and the other officers move quickly to secure the prayer room on the ground floor so paramedics can enter. Then they search the basement. A man has dragged himself downstairs despite having been shot in the leg. 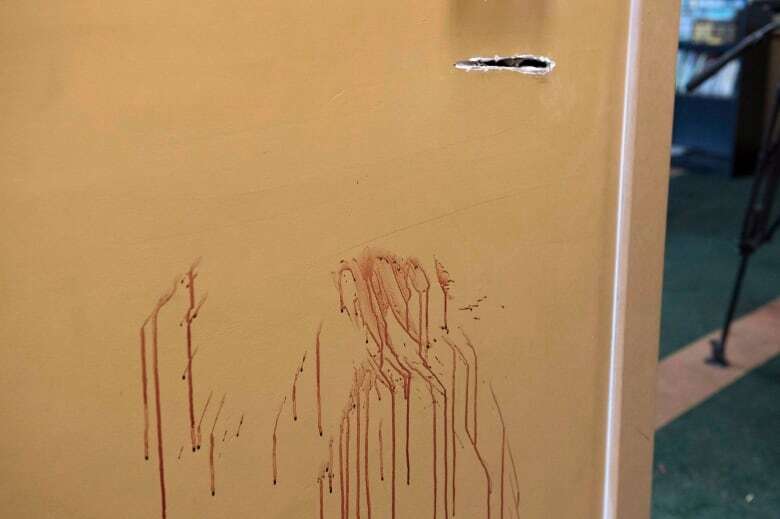 The bullet appears to have hit an artery. He is bleeding badly. Filteau's colleague, Francis Simard, rips a power cord from a water cooler and makes a tourniquet. Outside the mosque, David Munger is waiting with two other paramedics for police to clear them to enter. They have only a hazy idea of the situation inside. 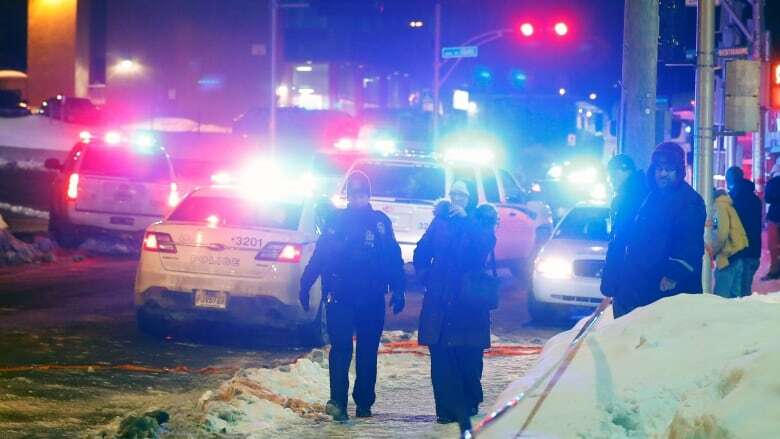 Munger, a supervisor with the Quebec City paramedics service, was giving a routine briefing at HQ when dispatch alerted him of a possible shooting with multiple injuries. He was en route to the mosque within two minutes. At first he is skeptical. Paramedics spend a lot of time responding to false alarms. Munger is only 31, but already he's been on the job for more than a decade. In fact, he's been hanging around ambulances since he was a boy. Both his father and uncle were paramedics in Quebec City as well. Even as he waits outside the mosque, he doubts whether he was really about to find himself in the middle of a mass casualty situation — something that every paramedic trains for, but which happens maybe once a generation in Quebec City. The last time it happened — when Denis Lortie killed three and injured 13 at the National Assembly — Munger hadn't even been born. The police officers emerge suddenly from the mosque carrying a body toward the paramedics. There is a bullet wound in his head. No pulse. "Oof, this is for real," Munger thinks to himself. "This is not a false alarm." Having conducted a quick search of the building, police wave the paramedics in. Munger escorts the first crew and helps begin the triage process. There is a chilling silence in the room as they assign coloured stickers to the victims, indicating who should be treated first by the other paramedics now arriving on the scene. Red for the most urgent cases; yellow for those who can wait; green for minor injuries. Black stickers will be attended to last. It will fall to Munger to declare them dead. Munger takes up outside the front door and begins counting the injured, calculating whether he has enough ambulances and coordinating with the area hospitals. He radios Quebec City's trauma centre, the Enfant-Jésus hospital. Expect multiple serious injuries, he tells them. 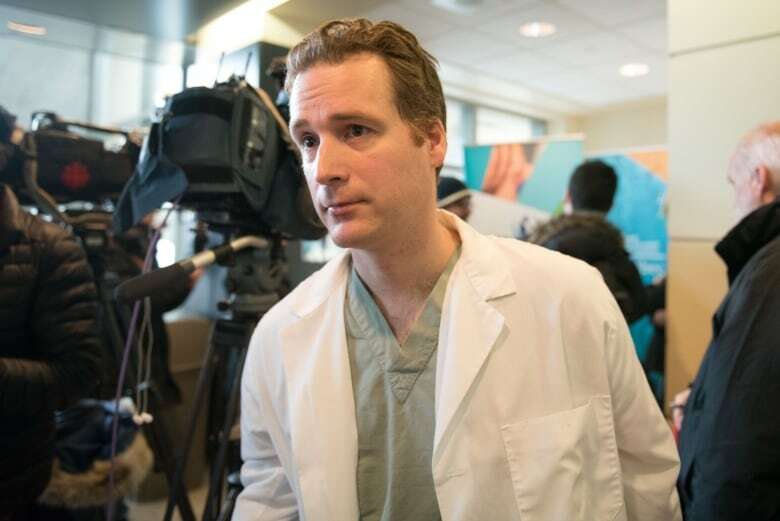 Julien Clément, the hospital's head of trauma is at home in his pyjamas, planning a summer vacation to Europe. His phone rings around 8:40 p.m. A fellow doctor says there's been a shooting at a mosque, but has no other information. "I'll drop by the hospital and see if they need me," Clément tells him. He arrives just as two critically injured patients are being wheeled into the operating room. They are rapidly approaching the end of the so-called golden hour — the 60-minute window between trauma and surgical intervention when the chance of survival is highest. Clément joins one of the operating teams. Their task, at this stage, is straightforward. Stop the bleeding. Three surgeons work furiously to plug the bullet wounds. Forty-five minutes later they succeed. The patient will survive. By now, other members of the hospital's surgical team have arrived. Clément leaves the OR and takes on a coordinating role. Sixteen years in the Canadian Forces; three tours in Afghanistan. 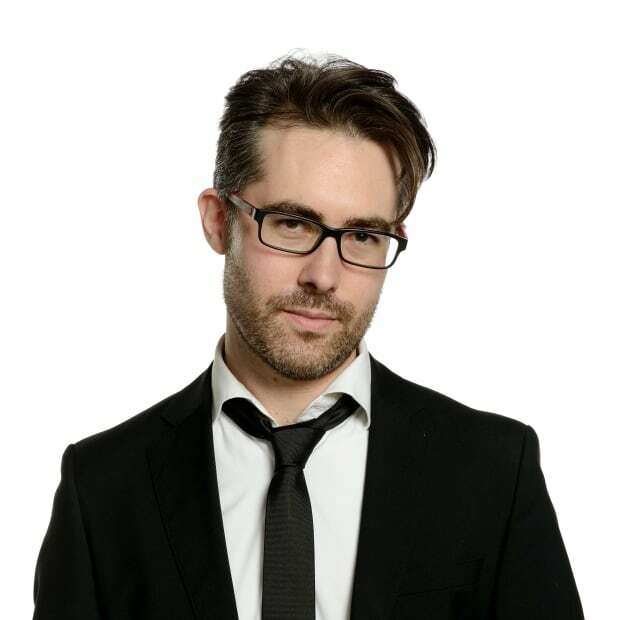 Clément worked as a surgeon at the combat hospital in Kandahar, one of the bloodiest theatres in the whole war. ​Those reflexes are kicking in as he examines patients, assigns doctors and prioritizes surgeries. Five people are admitted to Enfant-Jésus that night with critical gunshot injuries. All will survive. But Clément will also encounter something for which he did not train. He enters the waiting room around 11 p.m. to find close to 50 members of the Muslim community racked by worry and desperate for information. Clément struggles to provide what details he can. Many are searching for relatives they can't locate. Their names are not on the hospital's list of patients. He knows that means they are likely dead, but he can say nothing. It will take Quebec City police roughly 24 hours to inform the families of the six men who were killed. But most cannot wait. Louiza Hassane has already spent several hours looking for her husband, Abdelkrim Hassane, when around midnight she decides to head to the morgue. She has not heard from him since he decided to go for a run earlier that evening at the Laval University sports centre, leaving his cellphone at home. As the hours ticked by, Louiza called the security guards at the centre, wondering if he was still there. He wasn't. ​When she learns from a friend there has been a shooting at the mosque where Abdelkrim prays, she fears the worst. She calls her aunt and uncle in Montreal, who have been like second parents to her family since they arrived in Canada seven years earlier. "Abdelkrim is dead," she shouts into the phone. Her aunt, Zahra Boukersi, tries to reassure her. Abdelkrim's friends are also searching the Quebec City hospitals for him. One of them gently recommends that Louiza try looking at the morgue. He isn't able to tell her what he already knows. Boukersi is, in the meantime, calling her niece repeatedly, trying to get an update. Louiza finally answers. "Abdelkrim is dead," she shouts into the phone, again and again. "He's dead. I just saw him. He's cold," Louiza answers. The night of the shooting it snows fiercely on the long, lonely stretches of highway that lead from Montreal to Quebec City. When the storm relents, around 4 a.m., Louiza's uncle, Saïd, departs for Quebec City. 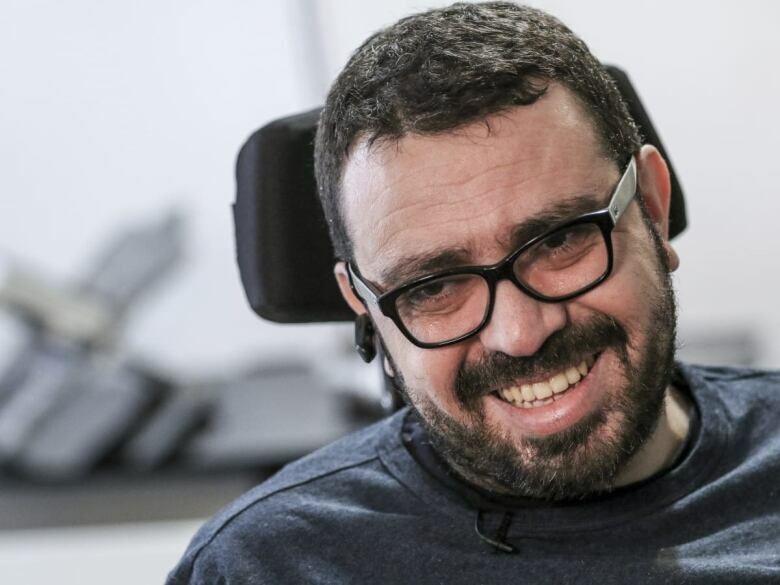 He wants to help Louiza tell her three daughters about their father's death. The older girls went to school that Monday morning not knowing why he hadn't come home the night before. When they return from school, Louiza and Saïd take them aside. But before they can say anything more, Louiza's precocious middle daughter, aged seven, interrupts them. "You have something to tell us, but I have something to tell you too," she said. "At school, my teacher told us there was a crazy person who shot Muslim people at the mosque. Six people were killed." She learns then that her father was one of them. Later that year, when she hears her mother talking with Boukersi about her father, the young girl will ask them to stop. "Don't speak about daddy, please," she tells them. "It's very painful for us to hear you speaking about daddy." Drawn from a Radio-Canada interview with Aymen Derbali conducted in November 2017. This section is based on court documents filed by prosecutors as part of the proceedings against Alexandre Bissonnette, who stands accused of the shooting. It is also based on an email exchange with Sgt. Filteau and a CBC Montreal interview with him on Jan. 29, 2018. Mohamed Belkhadir described his experience to Radio-Canada on Jan. 30, 2017. Drawn from a CBC Montreal interview with Munger, Jan. 15, 2018. Drawn from a CBC Montreal interview with Clément, Jan. 18, 2018. Drawn from a Radio-Canada interview with Louiza Hassane on Jan. 30, 2017, a CBC Quebec City interview with Abderrezak Redouane, Jan. 31, 2017 and CBC Montreal interview with Zahra Boukersi, Jan. 9, 2018. Drawn from CBC Montreal interview with Zahra Boukersi, Jan. 9, 2018.